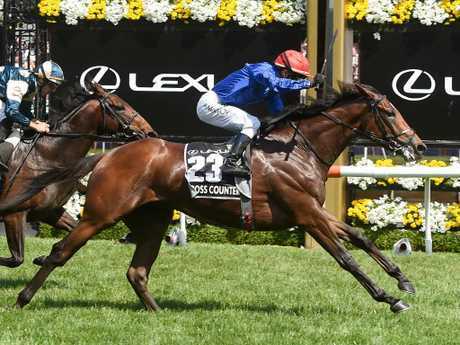 UPDATE: Cross Counter has won the 158th Melbourne Cup in a famous finish to the race that stops the nation. Cross Counter was too good. There was drama earlier in the day as wet-specialist Magic Circle was drawn into favouritism on the back of heavy downpours and Flemington officials rating the track a Heavy 8. However, as the showers cleared and the track returned to a Soft 6, early fancy Yucatan reclaimed race favouritism with some bookmakers as the track continued to dry out following Race 6. UPDATE: English singer Sam Smith has left racegoers calling for more after a thrilling live performance in front of the Flemington members. Smith's performance coincided with a break in the weather with the sun peaking out from behind the clouds just in time for the Cup. The performance came after a crushing moment for Cup jockey Mark Zahra. Jockey Mark Zahra has weighed in 0.5kg over. Zahra chalked up a win in the earlier Bumble Stakes at Flemington on Tuesday, but his Cup horse Ventura Storm will now carry extra weight in the 3200m classic. The five-year-old gelding will carry 54.5kg. 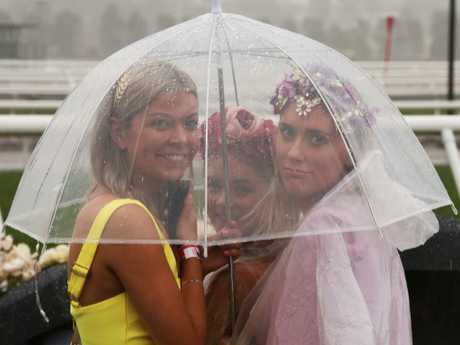 EARLIER: Heavy rain is causing chaos at Flemington - and in the betting markets - but at this point the main event is still scheduled to start at 3pm AEDT. 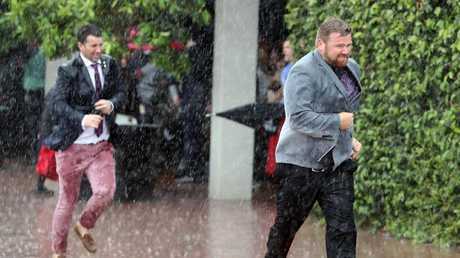 A deluge of rain made for a treacherous start to the day, forcing delays to races and trains to Flemington. 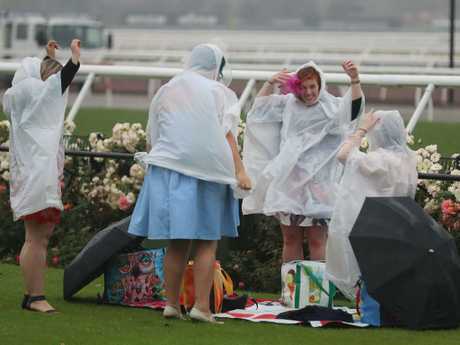 The area was drenched with as much as 18mm of rain, prompting fears jockeys and horses were at risk of injury. The track was downgraded immediately after Race 1 to a Heavy 8 and Race 2 was pushed back to an 11.40am (AEDT) start. Is anyone out there having a better #MelbourneCup Day than these two? 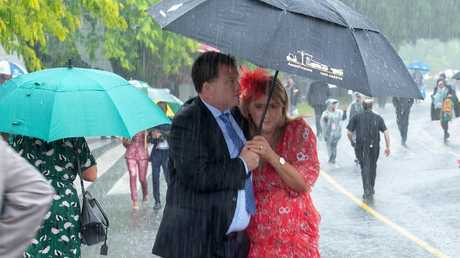 Jockeys complained they were unable to see at times during the first race of the meeting and Channel 7's Hamish McLachlan said officials were refusing to walk on to the track because the conditions were too dangerous. "Right now, all of the strappers have taken the horses underneath, they've decided not to bring them out. It's too wet and too dangerous - there has been thunder and lightning," McLachlan said. "It's a Cup that I've not seen before." 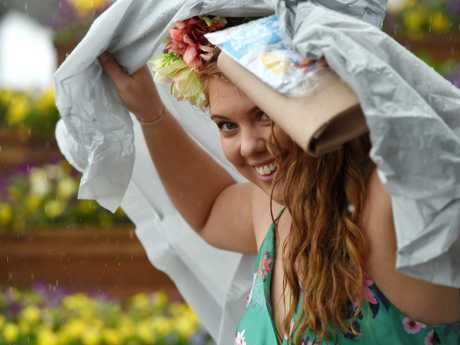 It's not just #Flemington getting soaked today. Parts of Southbank in inner #Melbourne have flooded after heavy rain this morning, and more wet weather is still set to come 🌧️. Trainer Richard Freedman, who has Auvray in the Cup, said the conditions and the downgraded track have completely changed the outlook for the $7.3 million feature race. "I tell you what, this rain, it will change everybody's tactics too," Freedman told Channel 7. "It has changed the whole race meeting. 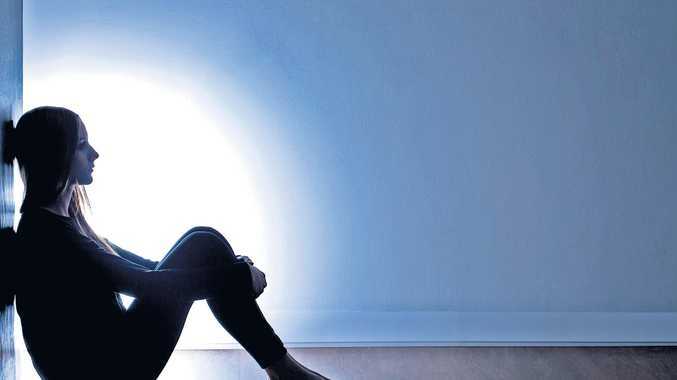 Whatever the tips were before the rain came, just throw them out the window and start again." Chief steward Robert Cram has been inspecting the track before each race and expects the rest of the meeting to go ahead on-schedule and is confident the Cup will not be delayed from its traditional 3pm timeslot, according to The Herald Sun. ⚠️ Flemington Racecourse line: Our crews are currently on-site attending to the flooding. Channel 7 racing commentator Jason Richardson said stewards may consider a major delay to allow track staff to aerate the entire track to allow some of the surface moisture to be absorbed. He said one slip from a horse is all it could take for jockeys to pull the pin on the meeting, citing "unsafe conditions". "No (the day won't get called off), they have a choice of trying to aerate the track to try to get the water to soak in or we have a delay and try to let the showers pass and try to see if the water will soak in," Richardson said. The chaos extended beyond the track with suites inside Flemington reportedly leaking from the ceiling. There are also ongoing major service delays across the Melbourne public transport system. According to reports, racegoers have been informed to walk from a nearby station after flooding at Flemington Racecourse Station. There was carnage on the roads to with reports of horrendous traffic delays for drivers trying to get into the main car park at the racecourse. 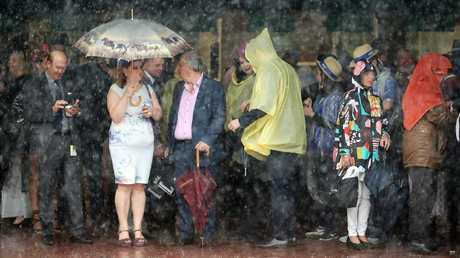 It left racegoers wrestling with the option of leaving the track to find some dry shelter. Terry Evans, who has been working as a bookie for the Melbourne Cup since the early 80s, says today is the worst he's seen in more than 40 years. "Since 1976 when Ven der Hum won it's never been as bad as this," he told news.com.au from under his umbrella. "It's just too wet to come out." Paul Thompson, who has worked more than 36 years at Flemington, says he's hardly received a bet all morning. "There has been three or four days similar to this in the past, but the rain was well spaced out," he said. "This is solid rain at the wrong time of the day. 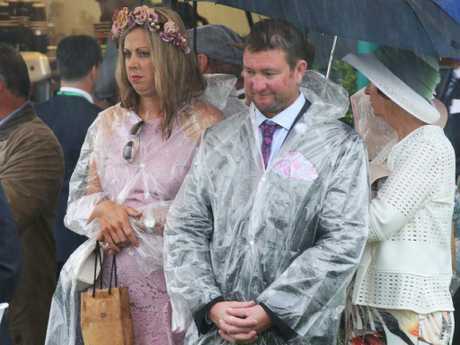 "People are deciding whether they will come or not, it's very hard to say yes to attending Melbourne Cup when you look outside and there's heavy downpours like this." 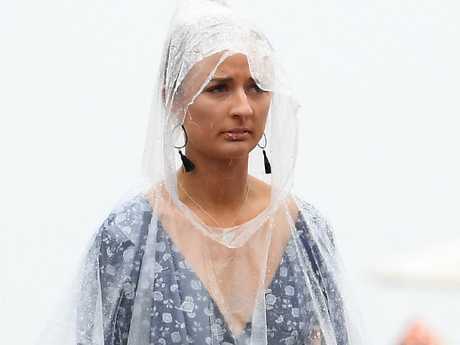 THERE'S nothing like spending your tax return on a fancy outfit for the Melbourne Cup only to have the heavens open and dump four years worth of rain on your nice new frock and hat. If you are in Melbourne and you see a fascinator sailing down the street today, don't be surprised. The rain is torrential. "The rain is good for the farmers". Her friend replied: "Yes but it's bad for my new suede heels". It's good that everyone has their priorities straight. Some people aren't letting the inclement weather break their stride and are standing firm in the muddy turf at the racecourse. To these people we tip our (damp) hat. 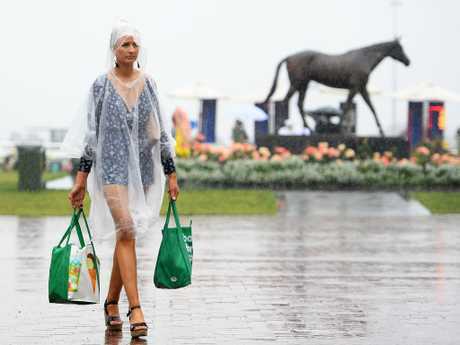 Early arrivals to Flemington are already copping a drenching as heavy rain and thunderstorms lash Melbourne. 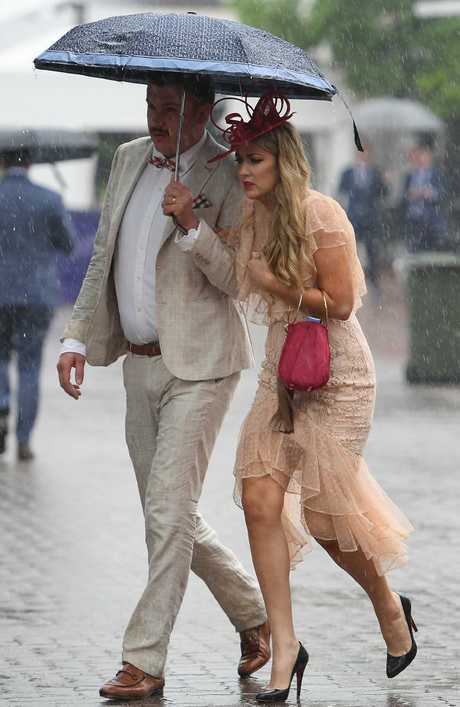 Bureau of Meteorology senior forecaster Michael Efron says five millimetres of rain had already fallen on Flemington Racecourse before the gates opened at 8.30am on Tuesday and the wet weather was set to continue. A BOM spokesman said storms could bring significant rainfall, but we're unlikely to beat Cup Day in 1942, when 46.5mm was recorded. 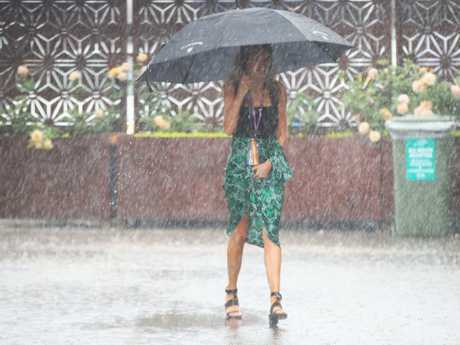 "We will start to see showers easing in the afternoon but are still likely to see showers during the main race as well," Mr Efron told AAP. It might also be a good idea to pack a warm coat, with southerly winds forecast to bring cold temperatures in the late afternoon, as punters begin heading home. "People heading home from Flemington are likely to have a pretty cold trip," Mr Efron said. It could be particularly cold for flamboyant British billionaire Marwan Koukash who has vowed to accept the trophy in his G-string if his horse Magic Circle wins the race. "That's the lace that's going to stop the nation," he told AAP at Monday's Cup Parade. A severe weather warning is in place for Melbourne and eastern parts of the state, as a slow moving low pressure trough brings heavy rain and thunderstorms. Those storms could lead to flash flooding in some parts. Here's how the rest of the country is looking while Flemington cops a drenching. Sydney: It's going to be partly cloudy and humid in the Harbour City with the mercury tipped to hit 31C. Slight chance of a shower, and the risk of thunder in the afternoon or evening. Brisbane: It will be mostly sunny in Brisbane today hitting 33C - with a chance of a thunderstorms in the west late this afternoon and evening. Adelaide: It's partly cloudy and reaching 20C. Medium chance of a shower, becoming less likely in the late morning and early afternoon. Perth: Those celebrating in Perth can expect cloudy weather and temperatures hitting 19C. Slight chance of a morning shower near the coast. Canberra: There's a high chance of showers in the nation's capital - and there's a chance of a thunderstorm during this afternoon and evening. Hobart: There's a high chance of showers, most likely during this afternoon and early evening, and temperatures hitting 19C. Darwin: In the Territory it's going to hit 34C with a chance of showers and thunderstorms.